Six more days until opening day for Lehigh Valley and with that, the Phillies have announced the ‘Pigs roster. The roster is as follows: Players age in ( ). Bold indicates on 40 man roster. Look for Jake Thompson to get the nod opening day. RP: Pedro Beato (30); Luis Garcia (30); Mark Leiter (26); Michael Mariot (28); Hoby Milner (26); Wander Perez (32); Cesar Ramos (32); Pat Venditte (31). –Expect to see Luis Garcia as the closer at the beginning of the season. –Hector Gomez played in the Korean League in 2016 and hit 21 homers. He has played in the majors for both the Rockies and Brewers. –The ‘Pigs play the Reading Fightin Phils in an exhibition game on Tuesday in Allentown before opening the season next Thursday against Pawtucket at 7:05. The Phillies completed their 25-man roster Thursday. Luis Garcia was optioned early and back at the Complex in the morning. Word filtered around that Adam Morgan and Joely Rodriguez would join the bull pen and complete the pitching staff. I found the following in my mail box from one of our readers. We met last season, but I hesitate to use a person’s name without explicit permission in a post. 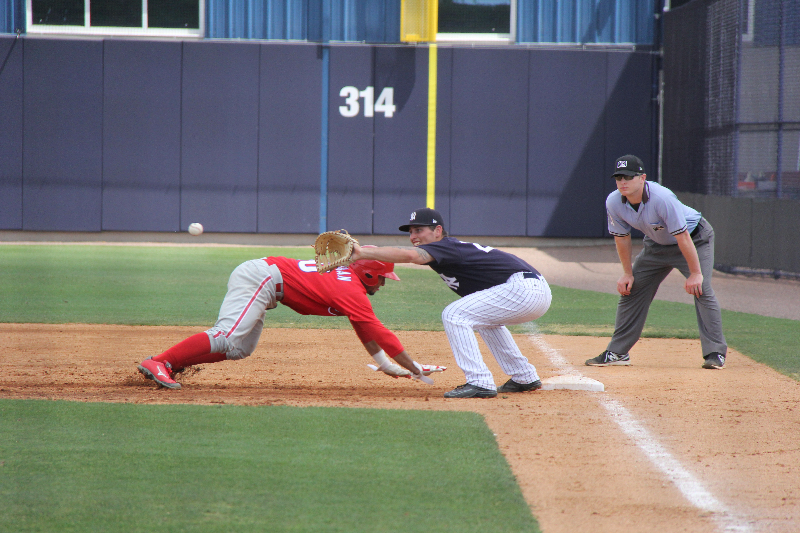 It is the account (with minor editing) and some pictures from one of the minor league games at the Yankees complex on Monday, March 27th. Thank you very much, sir. I got back late on Sunday night, so I wandered over to the Yankees complex and watched one of the two A games going on. The Phillies beat the Yanks 6-4. 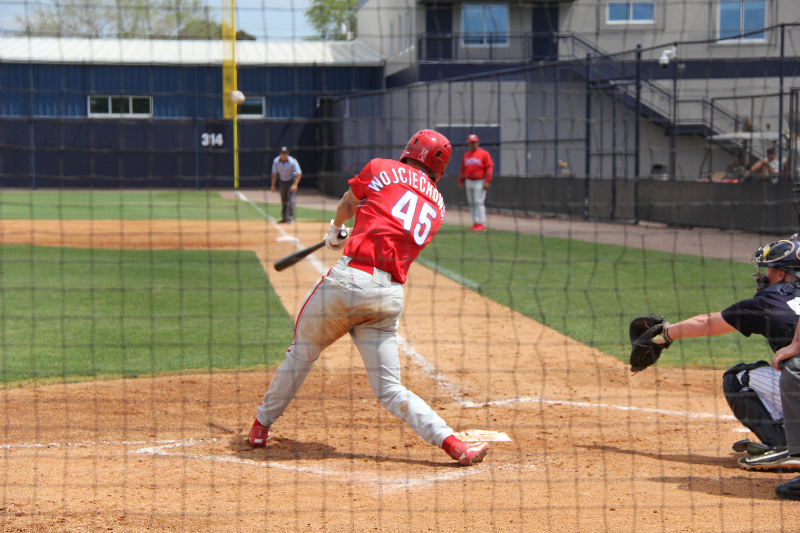 Barbier and Wojciechowski hit home runs in the 5th inning to give the Phillies the lead. Reggie Jackson was watching from the Yankees dugout. 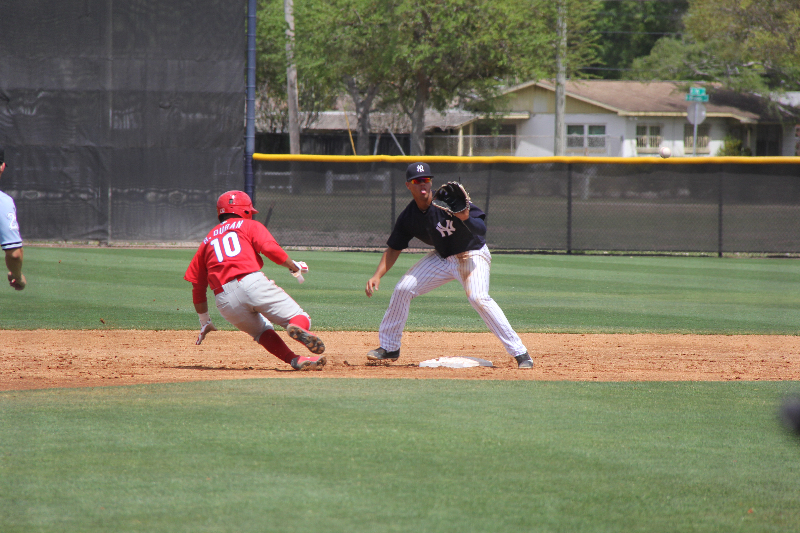 Other notables: D. Hall ripped a sharp single to right, Danny Zardon hit a double off of the center field fence Jhailyn Ortiz lined a single to left center, and Rodolfo Duran hit a sharp single to right field and also threw out a baserunner attempting to steal 2nd. Attached is a photo of the home run ball leaving Wojciechowski’s bat on its way over the right field fence. 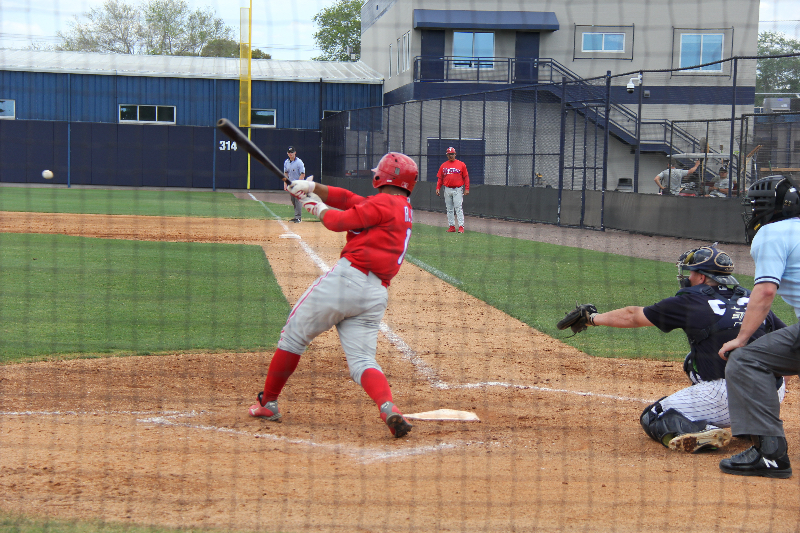 Barbier’s homer also went out in right field. Trevor Bettencourt pitched the 8th and had an effective change up. Jake Kelzer closed out the ninth. He gave up a 2 out one-run home run. Due to my being in zombie mode from the flights back, I can’t remember who started for the Phillies, but he was sharp through 6 innings. In separate e-mails, I will attach photos of R. Duran’s single to right, and Yankee attempts to pick him off of first base and second base. You can use any of the photos on the blog. Thanks again, sir. I look forward to seeing you at the Complex.